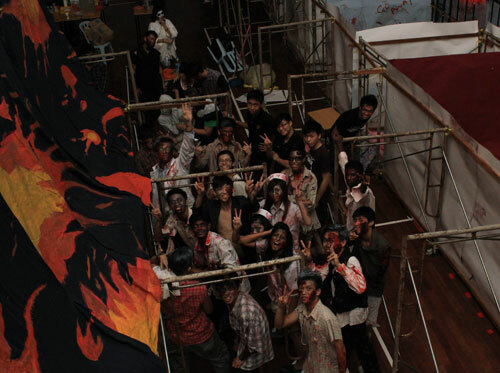 INTI’s Haunted Mansion, with a host of students stalking its halls as the ‘undead’, proved to be a major attraction, drawing over 1,200 visitors in four days and raising RM20,000 for charity in the process. For the organisers, it was an exercise in individual development and innovative learning, as they had built the mansion from scratch and in working as a team, enhanced their leadership, analytical and inter-personal abilities. One of the creepy passages in Haunted Mansion. As one of the largest student-built haunted attractions in Malaysia ever, the Haunted Mansion was designed by the Student Action (STACT) Club of INTI International University (INTI IU) in conjunction with the club’s 20th anniversary. The double-storey structure, from its formidable walls to its eerie interior, was erected within INTI IU’s Multi-Purpose Hall and took the 170 committee members 80 hours to construct. The scary cast of Haunted Mansion. “While we had planned the Haunted Mansion and other events with STACT Club’s 20th anniversary in mind, we are not merely marking our anniversary; we are celebrating our team spirit which has greatly contributed to the success of the club,” says Vickt Lim, Chairperson of INTI IU’s STACT Club. Proceeds from ticket sales to the Haunted Mansion were distributed equally among 20 organizations which included homes for people with special needs, the elderly, the disabled, and orphans. Other events that STACT Club had organised or co-organised as part of its community service and social responsibility initiative include 30-Hour Famine Camp, Community Service Camp and Charity Run. INTI’s students have numerous opportunities to develop their talents and full potential on their journey of transformation to become competent graduates that includes learning experiences beyond the classroom. With strong support from faculty, students are given proper guidance in realizing their various initiatives to help the local community. Coupled with the right academic delivery and readily available cutting-edge facilities, students are able to further enhance their learning experience by translating classroom activities into real life initiatives. These lead to their gaining firsthand experience in event management, communication strategies and leadership development.